The supremely worshippable Srila Prabhupada has delivered the message of Sriman Mahaprabhu to this world by accepting the Brahma-Vyasa-Madhva sampradaya. Sri-Brahma-Rudra-Kumara – these four bona-fide sampradayas have eternally invoked inexhaustible auspiciousness by appearing in this world. These four srauta-sampradayas (lineages based on the descending revelation of knowledge) are eternally manifest. All of them have accepted the method of sruti (divine knowledge which is heard) as the principal pramana (evidence). Apart from these four srauta-sampradayas there are many other sampradayas in Bharata-varsa who claim to be srauta-sampradayas, yet they are not surrendered to the medium of sruti and propagate individual opinions that are actually against it. Even amongst the four srauta-sampradayas there are conceptual differences and uniqueness in their specific approach towards bhajana. The service of Bhagavan performed within each of the transcendental rasas also has individual characteristics and gradation. Although each philosophy and bhajana of each sampradaya is considered to be the best by them, still, if we judge from an impartial standpoint, there are gradations and differences. Judging without prejudice one comes to realize that whatever Sri Caitanyadeva has contributed philosophically by accepting the Brahma-Madhva sampradaya should be considered to be the highest. 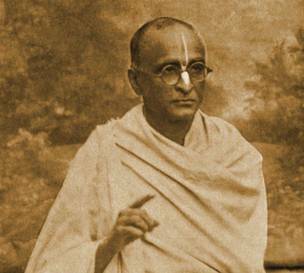 The teachings and conclusions of the Srimad Bhagavatam, the crest-jewel of all the scriptures and the natural commentary on the Vedanta, has been delivered to this world by Sriman Mahaprabhu and Srila Prabhupada (Bhaktisiddhanta Sarasvati Thakura). During the manifestation of Brahma, the true message of the Bhagavata was not revealed and was also hidden during the time of Sriman Madhvacarya. Sriman Mahaprabhu and Prabhupada have distributed this very message of the Bhagavata in a more revealed way to the world. 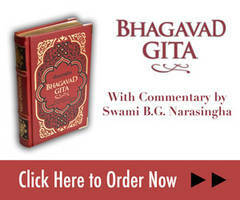 It may be asked whether the message of the Bhagavata was present in this world before Sriman Mahaprabhu. Is the message of Mahaprabhu and Prabhupada something new? Are there differences between the transcendental acaryas? The answer to all these queries is this – all the acaryas are fundamentally the same. During the time of different acaryas, the same singular principal either contracts or expands when revealed according to Krsna’s desire. Among the acaryas there is no ignorance or difference of opinion. Yet as regards the revelation of philosophy there are gradations. The knowledge of the Srimad Bhagavatam was preached profusely during the time of Mahaprabhu. It was seen that Brahma, in spite of being the original spiritual master (adi-guru), pretended to be in illusion during the pastimes of Krsna. The verse, muhyanti yat-suryayah instructs us that even the demigods become bewildered in trying to understand supreme knowledge. In spite of Brahma being eternally liberated, he performs such pastimes in order to delude the demoniac. Whatever illusion we are subject to is not the same as Brahma’s. In spite of verbally accepting allegiance to Srila Vyasadeva, various schools of Mayavadis, karmis and yogis have established their own interpretations. Even acarya Sankara, although declaring Srila Vyasadeva to be his guru, had the audacity to establish the concept of illusion (maya). Sriman Madhvacarya has established the natural siddhanta of Sri Vyasadeva. Sriman Madhvacarya accepted the sac-cid-ananda form of Sri Krsna and preached that His worship is the topmost. In other bona-fide sampradayas Krsna is not accepted as the only object of worship. Sriman Mahaprabhu accepted the sampradaya of Sriman Madhvacarya based on service to the Supreme, namely the philosophy of eternal service to the sac-cid-ananda form of Sri Krsna. Because it declares the worship of Sri Krsna to be the topmost, Sriman Mahaprabhu accepted this sampradaya. He accepted the conception of sakti and service to the Vaisnavas from Sri Ramanujacarya. He also accepted Visnu-Svami’s raga-bhajana and the Dvaitadvaita-siddhanta of the Nimbarka sampradaya. Whatever the acaryas of the four sampradayas came to distribute to the world had some elements that were incomplete. It is not an exaggeration to say that the supreme position of the worship of Radha-Govinda, which Prabhupada revealed to the world by taking the essence of the four sampradayas following in the footsteps of Mahaprabhu, is unparalleled. The teachings that the aforementioned eternal acaryas of the four sampradayas have themselves revealed could be said to be partial revelation, while the teachings of the sun-like acarya Srila Prabhupada can be said to be their very source. Just as when compared to other elements, earth is unique because it is the only element where all five elements can be seen combined together, so also various rasas like santa, dasya etc. progressively advance to the confluence of madhura-rasa. Similarly, the lion-like acarya (acarya-kesari) Srila Prabhupada is the confluence of the quintessential teachings of the acaryas. Srila Prabhupada revealed and introduced service to the four acaryas in Sri Caitanya Matha and thus preserved their dignity and most significantly established his own unique position. Similarly, his conduct and preaching also manifested this uniqueness. Service to the Supreme as taught by all other acaryas such as Ramanuja, Nimbarka etc. are all included within the teachings of Srila Prabhupada. The supreme miracle of the service of Sri Radha-Govinda, as manifested by Srila Prabhupada, contains the teachings of all other acaryas within it. Presently it is observed that the concepts and conduct of acaryas of other sampradayas lack inner substance and only an external covering exists. If the spirit of universal service to the Supreme Absolute Truth, as shown by the supremely worshipable Srila Prabhupada, is accepted by other sampradayas, then they will also be fulfilling their objective and their deficiency will turn into fulfillment. We can see that presently all sampradayas are more or less, knowingly or unknowingly, accepting the teachings of Srila Prabhupada. Even if a fraction of what Srila Prabhupada taught remains in this world, then the world would be supremely fortunate. Srila Prabhupada did not subscribe to the conception of solitary bhajana or the idea of renouncing the world due to considering it to be illusory. He taught that we should see matter as having its true position as the object of enjoyment of Krsna and accordingly accept whatever is favorable. He never said that we should practice devotion to God on a part time basis and be involved in other materialistic activities during the remaining time. He preached complete service to the Lord. He has spoken about performing bhagavata-bhajana with yukta-vairagya for all time, place and circumstance. Simply renouncing our connection with this world is not the purpose of Prabhupada’s instructions. Instead of channeling material energy for Krsna’s service, if one adopts the path of renouncing matter in fear of becoming contaminated by it, this will have a negative impact on our hari-bhajana. Srila Prabhupada has taught us the practice of engaging everything pertaining to this world in the service of Krsna. This is the unique position of Srila Prabhupada. Srila Prabhupada has spoken about the cultivation of devotion to Krsna or activities dovetailed towards the immutable spiritual plane. But he has not prescribed endeavors in mundane perishable activities. Endeavours in such mundane activities cannot be considered as cultivation of devotion to Krsna. If we try to understand the teachings of Prabhupada through our own individual mental speculation we will ultimately be deceived. Like the demon Rakta-bija, we are constantly developing a multitude of fresh anarthas . If we approach Prabhupada’s teachings with various mental concoctions we will be unable to harmonise them. We will never be able to understand the harmonizing aspect of Prabhupada’s teachings through our own individual endeavors. Many acaryas who appeared before Mahaprabhu accepted Him. Srimad Advaita Prabhu, in spite of being older in age, served Mahaprabhu. The defect within the other sampradayas is that they accept Visnu, Rama and Krsna but they do not accept Mahaprabhu. As regards spiritual matters, while analyzing topics relating to the Absolute, there is no necessity of judging on the basis of historical antecedent and precedent. Whether it is in the past, present or future, according to the extent by which a place or a sampradaya deviates from the teachings of Srila Prabhupada, we should keep a distance from them. All of you kindly bless me that I have unflinching faith in the devotional siddhanta of Srila Prabhupada. Rakta-bija was a demon mentioned in the Markandeya Purana who was given a boon by Brahma that whenever a drop of his blood fell upon the earth, another Rakta-bija, as strong as the original, would manifest on the spot. He was finally killed by Goddess Kali who drank all his blood and devoured all the duplicate Rakta-bijas.